Here at Bouden Coach Travel we provide only the best in V.I.P transport. We specialise in chauffeured MPV hire and it would be our pleasure to provide this service for you. If you’re looking for corporate transport for yourself or for your clients you’ve come to the right place. For the ultimate experience in comfort, style and class choose Bouden Coach Travel. 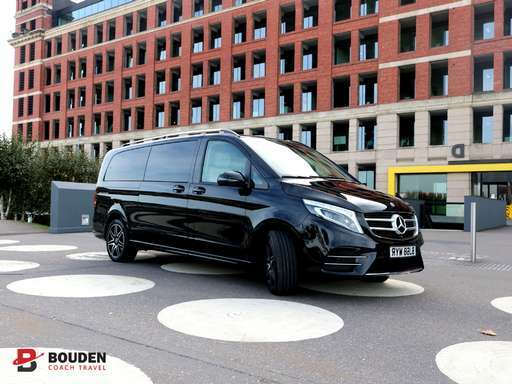 With the arrival of our brand new Mercedes V class MPV here at Bouden Coach Travel we are becoming the nations favourite not just for coach hire but for VIP transport and chauffeured MPV hire. Call 0800 112 3770 to enquire about our chauffeured MPV hire service. CLICK HERE for an online quotation for your MPV hire. Our professional and experienced drivers will pick up passengers from any UK location and transport you or your clients to their destination on time, hassle free and in style. To arrange your chauffeured MPV hire service call 0800 112 3770 and speak to a member of our team. CLICK HERE for a quick quote.